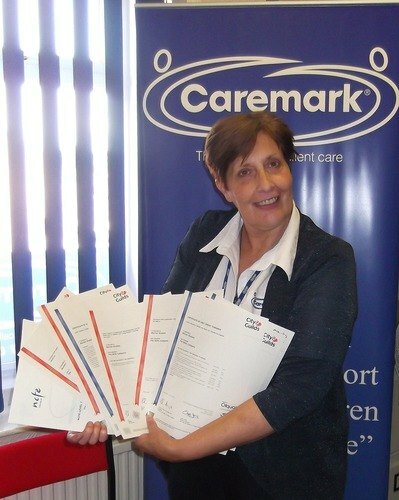 Marion Drydale, recently promoted Field Care Supervisor with Caremark (Oldham) has not always worked in social care. In fact, her career started in the public sector where she was the Manager of a Post Office which she enjoyed for sixteen years. When the job became more about having to hard sell to every customer that walked in than provide good service, Marion realized it was time to move on. Marion has worked for Caremark since 2011 and initially became interested in social care through part time voluntary work at a Women's Refuge which was set up by a friend. This experience sparked her desire to work closely with vulnerable people. She is now learning how to support women in the Domestic Violence unit. Marion really loves her work with Caremark and her volunteering at the Womens' Refuge. Both sectors require her caring skills. Her brother, who has learning disabilities and whom she cares for, has also given her experience and insight into caring for someone with specific needs. Marion initially started her social care studies at NVQ Level 2 and having successfully passed that she then went on to the next course which is the City & Guilds Advanced Level Apprenticeship in Adult Social Care. The 14 month course combined field based practice and theory. The extra study has given her a lot more confidence and led her to complete a Teaching Level 3 qualification and now she is working on Teaching Level 4. Marion puts all her success down to having an excellent Tutor who made each study course really interesting and approachable. Consequently she has discovered abilities that she didn't know she had. "Following this line of study has definitely helped me progress and I personally don't think people should ever stop studying," said Marion. "I am definitely more confident than I was too, and can now speak in front of people which I could never do before. So all in all, I am quite pleased with the way I am coming on." Reflecting on her achievements, Marion said "I think everyone should do it. Having these qualifications spur you on. Everyone wants to be good at their job and provide the best service. "Anyone considering a career in the caring professions shouldn't hesitate, whether they are men or women. Just go for it! It's so worthwhile. It's a rewarding job and you can have fun with the clients too! I really loved working as a care worker. Just knowing you might be making someone's day was really worthwhile as some of my clients would not see anyone else all day." Although often thought of as a predominately female role, caring is just as suited to men. Marion currently works alongside 7 or 8 male care workers. Sometimes male clients prefer to have a man as their care worker, particularly if they are providing companionship services, so there will always be a market for male care workers. Despite the thousands of dedicated care workers visiting people every day, it is unfortunate that home care sometimes gets bad press but as Marion commented: "This does happen occasionally and clients may initially react quite negatively when they have a new care provider, but this is soon put right once they start having really good care." Having just been promoted, Marion is now focusing on learning her new role and getting to know her care team and all the clients in her region. By all accounts, they will be in safe and very caring hands.